Have a backlog of recipes that I have been meaning to post and just not getting the time these days. Have just been occupied with work for the past few weeks, and with Ramazan here, its become more busy with the Sehri & Iftar preparations since my mother's not in town so I have to do the preps myself. Then with the spare time that I have, I try my best to do as much Ibidat as possible. So yeah, its craziness on top of craziness, but am going to start posting some recipes as well as some reviews, starting with typical Ramazan snacks, and then some recipes that can be made for dinner with a light iftar. Today its going to be one of my favourite Ramazan recipes - croquettes. My recipe combines mashed potatoes with chicken & capsicum along with instant noodles which makes it just that more yummy!. Marinate the chicken in the above mixture for about 30 minutes. Then heat some oil in a pan, and cook the chicken (add the remaining mixture as wel) for a few minute till its tender and the water has dried. Shred the chicken or pulse it in the food processer for a few seconds. Cook the chicken separately. Boil & mash the potatoes. Then mix potatoes, chicken, capsicum & noodles together. Add chilli flakes, lemon juice/vinegar, soya sauce, black pepper & white pepper. Adjust the seasonings to taste and add more depending on personal preference. Make balls out of the potato mixture, then dip in flour, then in the egg mixture, then in the bread crumbs mixture. Heat oil in a wok/karhai and then deep fry the croquettes till golden brown. 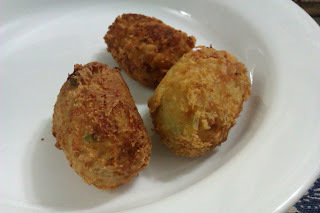 These croquettes can easily be frozen and kept in the freezer for 2-3 months and fried as needed. The croquettes need to be kept in the freezer after the coating has been done, because that will protect the potato mixture. I am sending this recipe to "Ramadan Friendly Recipes" event hosted at "the halal foodie"